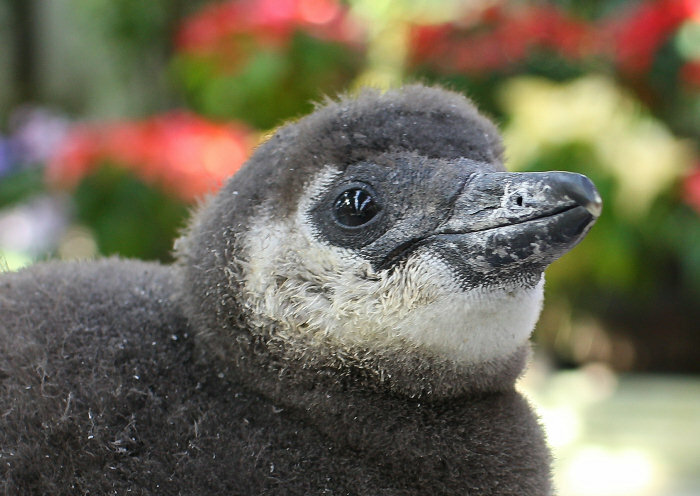 Today, January 9th, we show you latest shots of a Jackass Penguin nestling that hatched out on November 29th. 1월9일 11월29일에 태여난 자카스펭귄도 어느새 많이 컸습니다.오늘은 요즘의 펭귄아기의 모습을 소개드리겠습니다. 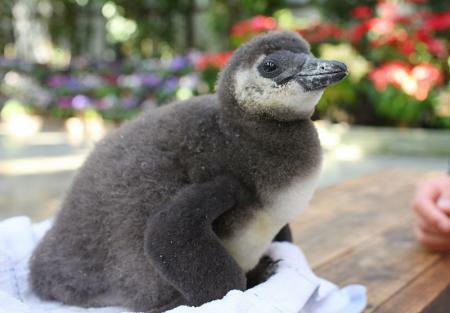 This picture was taken on January 8th, about 40 days after incubation. It weighed 1.2kg and it is about 30cm long. 이 사진은 펭귄이 태여난지 40일째 되는 1월8일에 찍은 것입니다.이날의 체중이 약 1.2킬로,머리끝부터 꼬리부분까지의 길이가 약 30센치정도였습니다. It has grown up to look more like a penguin compared to middle last month when it was featured here last. 지난달 중순에 사지찍었을 때보다도 많이 자랐습니다. A local NHK reporter visited the Garden yesterday, the nestling was moved to the Main Greenhouse for the report, and I took these pictures making use of the location. Mr. Mizuno, a staff member that rears the nestling, held it. 어제는 마침 지방의 NHK의 기자가 취재하러 오셔서 대온실에서 동영상을 찍고 있어 저도 같이 블로그용의 사진을 찍었습니다.펭귄을 안고 있는 것은 이 펭귄을 키우는 미즈노스탭입니다. It has cute round eyes. Another nestling, that hatched out on December 14th, is taken care of by its parents. 이 아기펭귄외에도 지난해 12월14일에 태여난 아기펭귄이 있는데 그 펭귄은 현재 어미펭귄이 키우고 있다고 합니다. 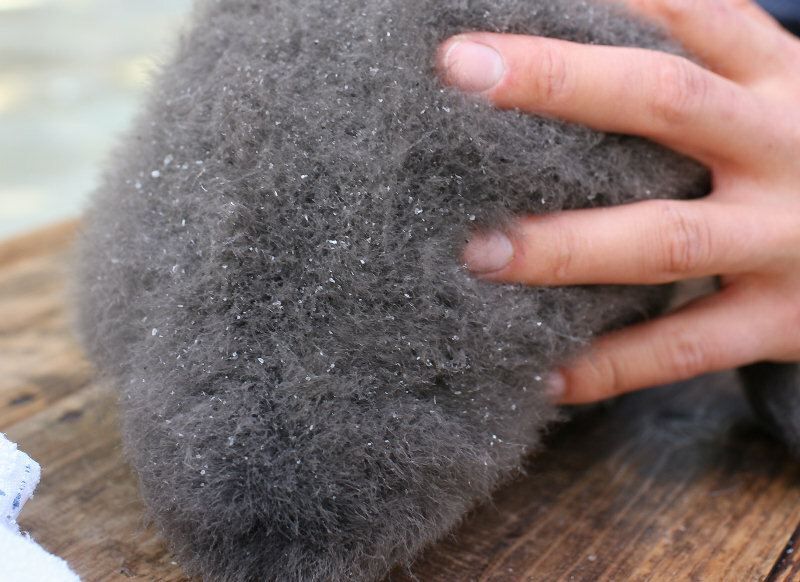 Back of the nestling, covered with down and scurf that is caused by emergence of adult feathers. 아기펭귄의 등.보송보송한 털에 또 아래에서 새로운 깃이 자라나고 있어 거기에서 나오는 흰색의 피지가 많이 보입니다. The nestling cannot go into the water until March when the down is replaced by feathers. 아기펭귄은 아직 물에 들어가지 못하는데 이 보송보송한 털이 다 빠지고 나면 3월쯤에 물에 들어가게 할수 있답니다. A shot with visitors that stopped by. 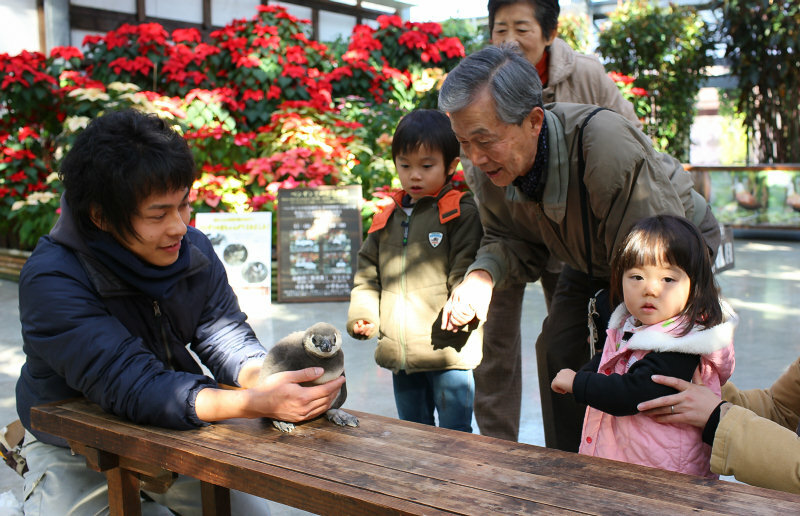 The nestling is exhibited by the Owl Collection in the Nagayamon building, and its name is sought from visitors until the end of this month. Please feel free to make an entry for its name during your visit. 이 아기펭귄은 현재 나가야문내의 부엉이전시시설옆에서 이름모집 겸 전시를 하고 있습니다.이름모집은 이달말까지입니다.당원에 오실때 아기펭귄의 이름도 꼭 생각해 주세요.